How would one go about adding Thermal Expansion's ores as chunk and piece results while sieving? I'm unsure of the code to add to the .JSON files here, and it's not auto-detecting their ores from the OreDict. I'm using ENA 1.10.2-0.1.16; is this behavior something that's changed in the latest version, or is it a change that needs to be detected for future versions? then nothing works in the crucible. What am I missing? Just curious but, does the mod now support all mods by checking ore dictionary? It's a pain to add every mod ore in the json files. It would be nice if the ores where added and rarity was based on world gen configurations. Having some strange behaviour, May try a clean install of the mod to fix. Jei isn't showing the sieve results anymore, the tabs don't exist. So apparently something with installing Tinkers after ex nihilo caused a glitch, once I deleted the configs and reloaded my server everything seemed to work ok. I'm also having that problem. Thank you for posting your solution here :) I'll try that later and see if it works for me as well. Let me know if you find another solution, as this one removes custom sifted rewards. Nope... If I delete the exnihiloadscensio folder and launch, I have the default recipes showing on JEI. If I change the SieveRegistry.json to my own, it stops showing on JEI :( I don't know if I have a problem on the json or if the problem is something else. I'm going to try to change just one sieve reward and see if it works. So.. I changed the first flint for gravel to level 1 (it was previously on level 2) and now it shows flint alone on JEI on level 1. So, I suppose I can't have my custom sieve rewards showing on JEI because there's something wrong with my json. Does this mod have a maven for addon development? 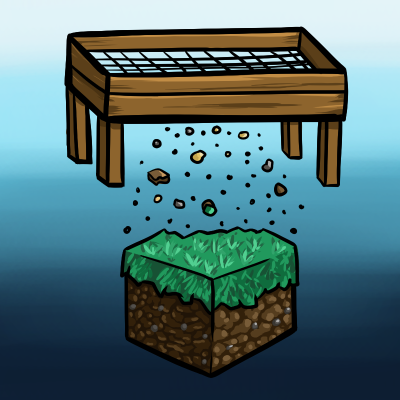 Multi-sieving should no longer throw items 20 blocks into the air, unless you have a block on top. Solution: Don't put a block on directly on top of the sieve." Can you leave the old way as a config option? It was rather fun to plan/build around. So, I can't seem to get the Witchwater > Soul Sand mechanic to work in my personal modpack. I tried to make clean install with just Ex Nihilo Adscensio, but it still doesn't seem to work. Do I need to add something to a JSON, or should it be enabled by default? can anybody give me a jason configured to double ores in sagmill and stuff? Normal dust only drop gunpowder and nothing else?